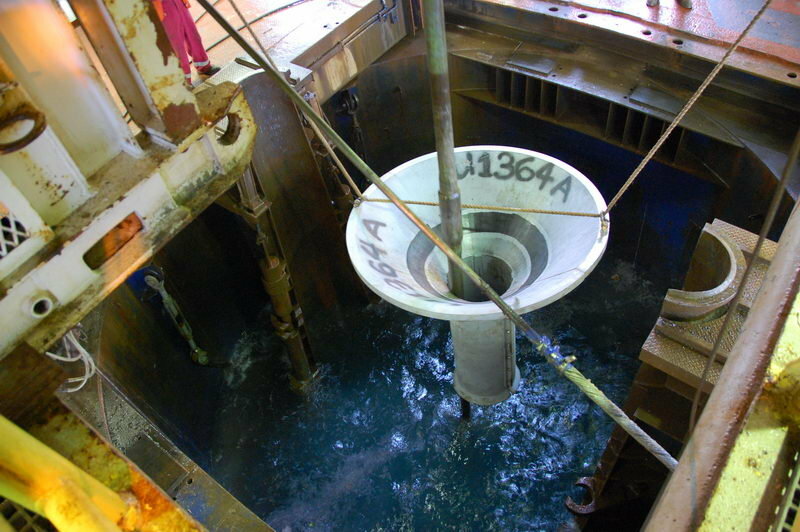 This last piece of the seafloor jigsaw is simply allowed to fall down the drill pipe to land in the hole created by the ROV platform affixed to the ACORK observatory. Its purpose is to make it easier for drill pipe to find the borehole in the seafloor and re-enter it. It landed perfectly, but then toppled over later. This makes it a little bit harder to get drill pipe back into the hole, but the seas are calm which will help. Here it is just before the rope is cut and it plummets through the moonpool.